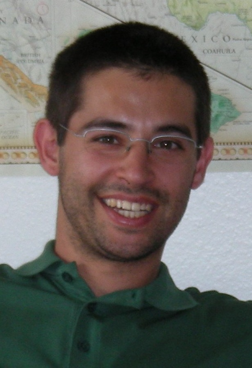 Giuliano Zanchetta received his PhD in Physics in December 2007 from the University of Milano (advisor Tommaso Bellini) with a thesis on LC ordering of short DNA fragments, for which he was awarded the Glenn Brown Prize in 2008. In 2008 he was a post-doctoral research associate at the University of Colorado at Boulder, in the Liquid Crystal Materials Research Center directed by Noel Clark, and he is currently a postdoc at the University of Milano, in the Complex Fluids and Molecular Biophysics Lab. The picture reproduces columnar liquid crystalline (LC) domains growing upon slow cooling in a concentrated aqueous solution of small fragments of double-stranded DNA (two couples of mutually complementary sequences: GGAGTTTTGAGG,CCTCAAAACTCC,GGAAGGTTTTGGAAGG, CCTTCCAAAACCTTCC). 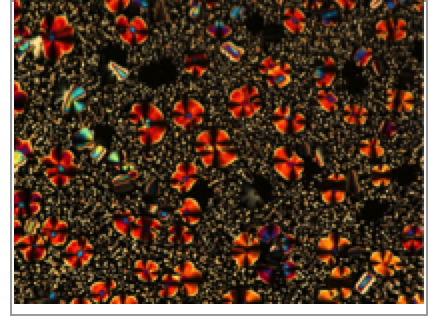 The picture was taken in polarized transmitted optical microscopy on a TE200 Nikon Microscope, with a Nikon DS-5M camera. Image size is about 800 x 600 micrometers (10x objective). The sample is between two glass slides spaced by a 10 micrometers film. Jury comment: This picture provides a beautiful rendition of the growth of columnar domains. The 'snowy' feel of the background made it seasonal (at least in the north!) as well as a technically satisfying picture. His research focuses on the experimental investigation of complex fluids and self-assembly of biomolecules, in particular the liquid crystalline ordering and phase separation in DNA and RNA aqueous solutions, interactions between liquid crystals and biomolecules, aggregation phenomena in colloids, polymers and proteins.